Background: Many smokers express a desire to quit smoking by gradually reducing the number of cigarettes they smoke until they stop completely. This study tested the efficacy of nicotine gum in facilitating cessation through gradual reduction. 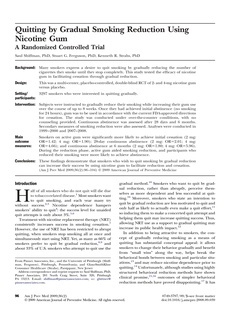 Design: This was a multi-center, placebo-controlled, double-blind RCT of 2- and 4-mg nicotine gum versus placebo. Setting/participants: 3297 smokers who were interested in quitting gradually. Intervention: Subjects were instructed to gradually reduce their smoking while increasing their gum use over the course of up to 8 weeks. Once they had achieved initial abstinence (no smoking for 24 hours), gum was to be used in accordance with the current FDA-approved directions for cessation. The study was conducted under over-the-counter conditions, with no counseling provided. Continuous abstinence was assessed after 28 days and 6 months. Secondary measures of smoking reduction were also assessed. Analyses were conducted in 1999-2000 and 2007-2008. Main outcome measures: Smokers on active gum were significantly more likely to achieve initial cessation (2 mg: OR=1.42; 4 mg: OR=1.90); 28-day continuous abstinence (2 mg: OR=2.01; 4 mg: OR=4.66); and continuous abstinence at 6 months (2 mg: OR=1.80; 4 mg: OR=5.96). During the reduction phase, active gum aided smoking reduction, and participants who reduced their smoking were more likely to achieve abstinence. Conclusions: These findings demonstrate that smokers who wish to quit smoking by gradual reduction can increase their success by using nicotine gum to facilitate reduction and cessation. © 2009 American Journal of Preventive Medicine.